Are you a digital marketer? Best practice marketers align their objectives with business outcomes to improve the organization; they use data-driven decisions to predict outcomes and can envision the impact of their work. They think strategically to maximize revenue and create contextual engagement with the customers they serve. To do this, they use solutions that aggregate the right metrics and tools that help them derive accurate insights. 1. Social interactions – Your firm’s social interaction ratio is determined by the total number of interactions all of your accounts received within the last week, month or quarter. You’ll first need to decide how frequently you’d like to measure your social media interactions, which is necessary to increase the number of interactions and build rapport with your customers and client base. Next, you’ll want to determine your share of the social voice. Share of Voice is defined as the proportion of the total audience commanded by your brand across its full range of media activities. Share of Voice is an accurate indicator as to where you rank compared to your competitors when people talk about your industry. 2. Amplification Rate – The amplification rate is the frequency at which your followers take your content and share it through their own network. It goes without saying that the higher the amplification rate, the further your content will reach. This will also increase your social media page views, which is the number of times a web page is viewed as a result of being directed from a social media channel. 3. Quality Score – The quality score is a score assigned by search engines such as Google, Yahoo and Bing that influences both the rank and cost per click of ads. The purpose of the quality score is to enable the major search engines the ability to maintain and improve the quality of advertisements listed on their sites. The primary reason for this is to improve the experience of users who click on sponsored links. The more relevant the advertisements, the greater the likelihood a user will click on them more frequently, which increases revenue for everyone. Those who achieve higher quality scores are rewarded with top placement and lower bid cost. 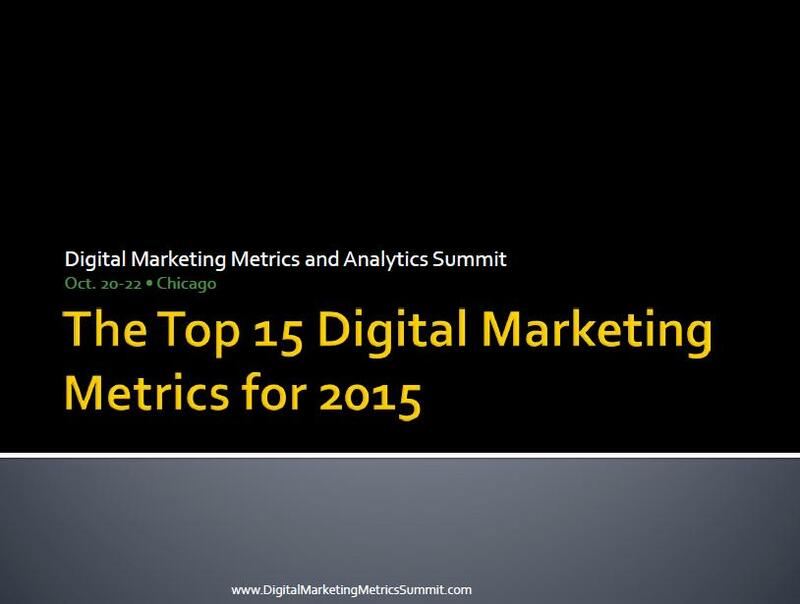 Download the complete list of The Top 15 Digital Marketing Metrics for 2015 to see what are the must-have metrics are for next year. Previous PostFor Hire: Is There Anyone Out There?Next PostI’m a Redskins Fan – Am I Racist?